Hope everyone is enjoying their Summer! 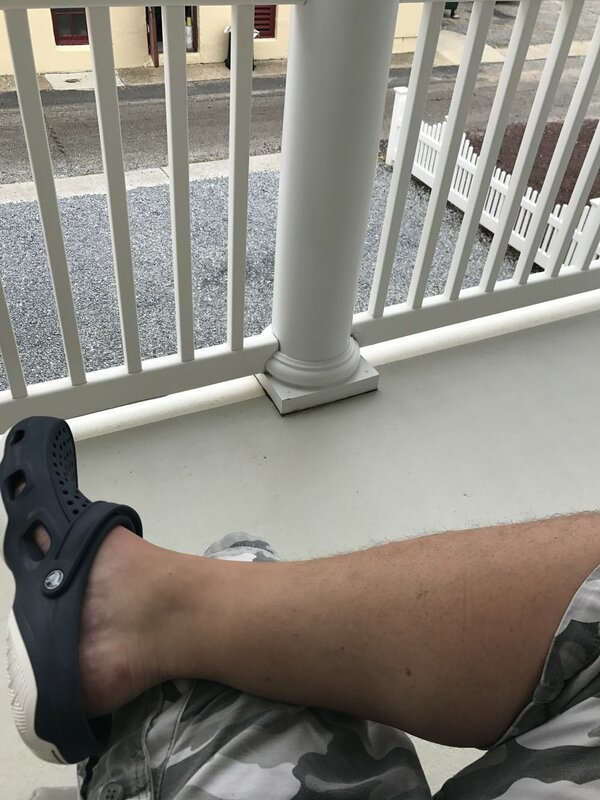 I'm currently relaxing at the Ocean City beach house on the last day, sitting on the deck with some free time so since it's been forever I figured, let's finallllly do post! Anyhoo, if you have been following the Facebook page (both personal and the band page) this year we have been popping up here and there playing some great shows to some great supporters. The band (aka The Core Four) has really locked in and we are enjoying hanging and playing shows together more than ever! We've had a few tweaks to the lineup here and there, but now I feel like we have finally gotten our footing and it's been really great the past few shows especially this year. Each show has been unique whether it's doing special shows like the all acoustic show in June or changing the sets for each gig to make it a different experience each time. Sometimes we will do our "shock and awe" set of no keyboard songs, just pure guitar driven/heavier stuff or the "just the tip" set where we put more of the "mellower" jams and the majority of the keyboard songs are back in. Plus even in those two versions we switch the set order each time and we have been adding more "new songs" to the list each time which I feel gives the people who show up a different experience at every gig, which keeps it interesting. one of our favorite places to play Seaside Tavern! So the plan is once I get back from vacation tomorrow starting next week I NEED to book time so I can finally finish my new album! The majority of the album is recorded, I just need to book two more sessions to have the live drums and vocals recorded and we will be good to go. Then once mixed, mastered, etc. I'll probably be shooting for a Fall release date. At this time, if you have been going to our shows you've probably already heard the majority of the album already since I think we do more songs from there than HEAL at this point! But I am anxious to get it done and out there for people to hear. Bands/artists always say "it's the best stuff we've done so far" when a new album comes out, but in this case I feel the same way. As much as HEAL will always hold a dear place in my heart and as much as I love it to this day, this new one I feel the songwriting, playing and overall sound has really progressed. I feel like I am finally comfortable as a songwriter/lyric writer at this point and I feel the confidence shows. also very comfortable playing guitar in a band for the first time ever..it's fun! I'm also excited to "kinda announce" the new album will be produced/engineered this time by the talented and awesome Ritchie Kennon at Barking Dog Studios in Brewster NY! He recently took over the studio we rehearse in weekly and I've known him for decades so I'm excited to get in there, finish the drums/vocals and see what we can do together. We've played numerous shows together when he was in SubZero and it's been great reconnecting with an old friend to work on this project. I've heard some of his work and it's amazing. He once recorded our rehearsal with this new boom type mic he had in the room and once I heard back I said to myself "man if he can make us sound killer just doing that I can't imagine what EBTD will end up sounding like!" So I hope to have some more news on the progression on the album starting in August. Another plan which you will see soon is I'm debating putting up a crowd source funding campaign to help with the costs of recording the rest of it. My last album although thanks to the brilliant Darrell Long helping me out and recording the majority of the tracks myself, to put it out on Front Street, between travelling to CLE to record with Darrell, some recording at Brewster, packaging/printing cassettes and the overall costs of mastering and putting it out online I'd say I spent easily $1.200-$1,500 total on recording/releasing HEAL. Compared to some professional recordings that's pretty cheap, but still that's out of my own pocket. For me, when I approached HEAL I wanted to finance it myself cause my philosophy was always "if you don't invest in your own art, who else is gonna?" I wanted to fail/succeed on 100% my own dime and terms. But looking back for this release I wanted to switch it up a bit now that the name is out there and the band has more traction. People now know what they are getting into if they decide to "invest" this time. Not that I am complaining by any means, let's break it all down for you shall we? i sold the cassetttes on my website for $10 so that's double the $ right? Its getting better, but Think of this next time you cry about purchasing music. I heard recently the majority of people now listen to music on YouTube? I get it, why buy the cow when you can get the milk for free? As corny as it sounds, it's never been about money for me when it comes to music. For me it's always been about putting out good quality products so I can look back at it and say "yeah I did that" and be proud of it. so....be on the lookout in the next week or so for he launch of my crowdsourcing campaign for the new album which will be done exclusively ON MY OWN WEBSITE! The way I see it is, I'm only going to be preaching to the converted for this so why use a service when I have the means of doing it on my own? There will be a ton of really neat incentives for donating and that way besides the card transaction fee (see above) the majority of the revenue generated will be going to US and the incentives.